The Nagel 33 is a high-end 9 x 12 cm camera but is difficult to use. Fitted out with a Schneider - Kreuznach Xenar with horizontal and vertical shift, this camera uses 9 x 12 cm sheet film. 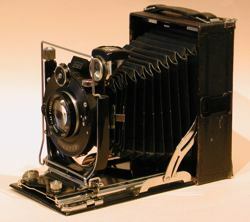 It has three viewfinders : one made of two steel frames, a waist-level finder and a ground glass. A little spirit level is mounted on top of the lens but it is more an element of decoration than a usable feature. The bellows can be extended twice the length of the camera's door for close-up work. Its very poor ergonomics make it difficult to use but its very good lens and the size of the negative are worth the effort.